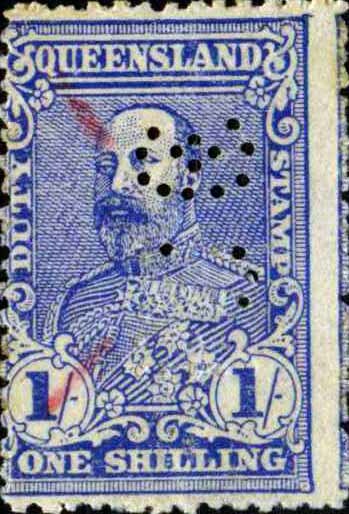 KEDVII 1908 issue 2d, 3d, 1/-. Rarity Scale: KEDVII 1908 issue 2d R4, 3d R4, 1/- R4. KGV 1917 issue 2/- R4. Numeral 1d R4, 2d R4. Background: Foggitt Jones commenced trading in about 1904 and became manufacturers and distributors of a range of pork and animal products such as cheese, pate, hams and other meats from a number of sites in and around Brisbane. Initially they operated from a basement location in Adelaide Street as well as a production site in Oxley (inner Brisbane) and later at a multi storey factory off Riverside Drive on the Brisbane River. They later expanded their distribution and production facilities to Sydney and Perth respectively. Device: The FJCO device was most likely a single die device. 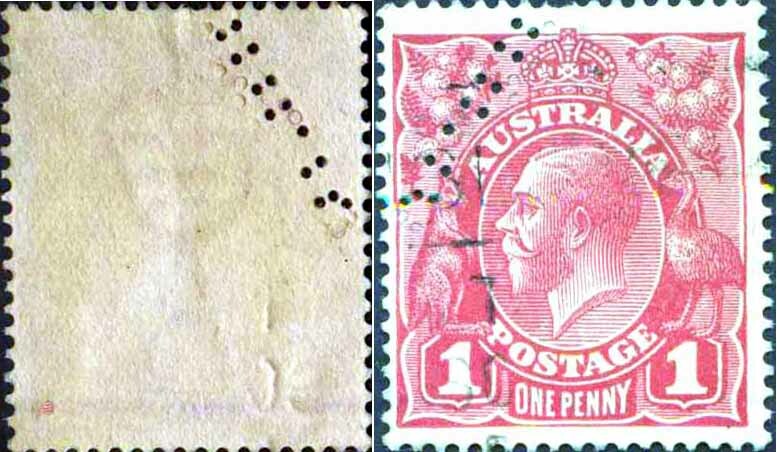 Foggitt's Brisbane sought and gained approval to perforate stamps in July 1914. The pattern is found on revenue stamps from around this period (1914) until at least 1956. It is also found on postage stamps from 1914 but there is no usage after the late 1940s. No railway parcel stamp use is reported. The continued usage of the device on revenue stamps after use on postage stamps has ceased is a common practice in other large firms and may be due to the advent of Meter devices to provide secure postage while perfins continued to be used on revenue stamps. The pattern is found in the usual variety of positions characteristic of a single die device. User: Finney Isles & Co Ltd. Address: Adelaide, Edward & Queen St, Brisbane, QLD. London (buying office). 1902 issue 3d R4, 6d R4, 1/- R4. Background: Thomas Finney and James Isles arrived in Brisbane from Ireland in 1862, they were both 25 years old. Isles was a Scotsman but they had worked together in a drapery in Ireland before deciding to emigrate to Queensland. Within two years they were in partnership in a drapery business, Finney, Isles and Company Ann Street, Fortitude Valley and traded at the Valley Exchange. By 1869 the business had expanded to include branches at Gympie, Rockhampton and Maryborough and a year later they opened a Brisbane store at the City Exchange in Edward Street. In 1873 the Company purchased these Edward and Queen Street premises and expanded their range of goods and services to include tailoring, furniture, hardware and furnishings. By 1909 with additional property purchases and building works their Edward Street premises had grown into a Department Store and they occupied the entire frontage between Queen and Adelaide Streets. Later the company opened stores in Maryborough and Murwillumbah as well as building up the London buying office however they closed their Gympie and Rockhampton stores. Both Finney and Isles were active in politics, trading associations, the welfare of their staff, and Finney served on the boards of the Brisbane Fire Brigades and Water Board. Isles joined the Brisbane City Council in 1883 and he died in November 1888. 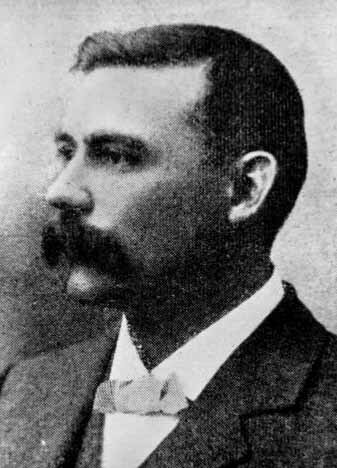 Finney had joined the Toowong Shire Council and in 1896 was elected to the Legislative Assembly for the seat of Toowong which he retained until 1902. 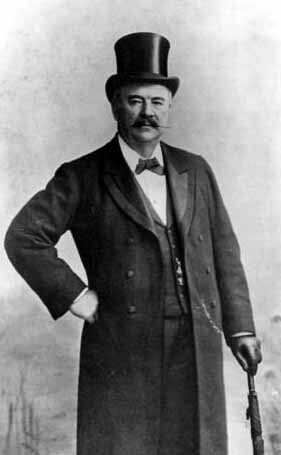 Finney died in December 1903. 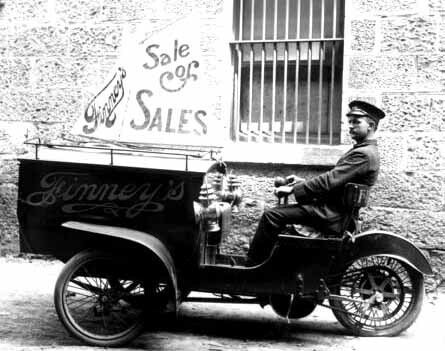 Finney's was restructured in 1905 as Finney, Isles and Co Ltd by the two remaining partners of Finney, Isles, and Co., William John Coakes and Joseph Kilroe, who came to the conclusion that, owing to the death of Thomas Finney, it was desirable that the firm should be converted into a company. By 1905 the company employed over 440 staff with 388 in Brisbane, 40 at Maryborough, 6 at Murwillumbah, and 10 in London. 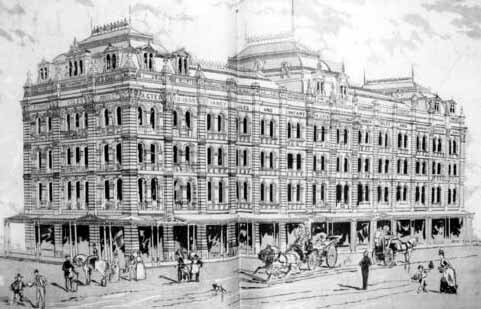 Finney's continued to expand to become the major Department Store in Brisbane. Finney's was taken over by David Jones Limited in 1955. Device Information: The device was an interesting one in that it produced a strike at 55 degree angle (approx) across the stamp. This was most likely done in order to fit the word "Finneys" onto the rather narrow stamps of the time. It was most likely a single head device and despite the angled nature of the pattern partial strikes are common, as are multiple strikes. All recorded Finney's railway perfins have been sent out of the Adelaide, Edward & Queen St store, from Brisbane Central Station and are found on the 1902 to 1914 series. 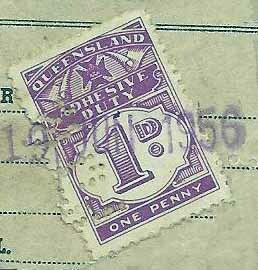 After 1914 Finney's chose to take up the free offer (and free advertising) from Queensland Railways, and have their name printed in the lower cartouche of the railway stamps. 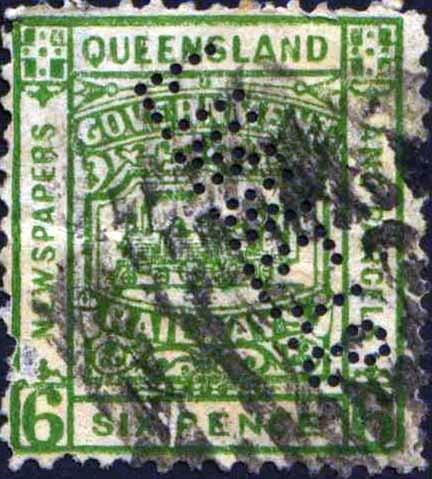 Although use on railway stamps ceased in 1914 the device continued to be used on postage stamps of Australia until about 1920. 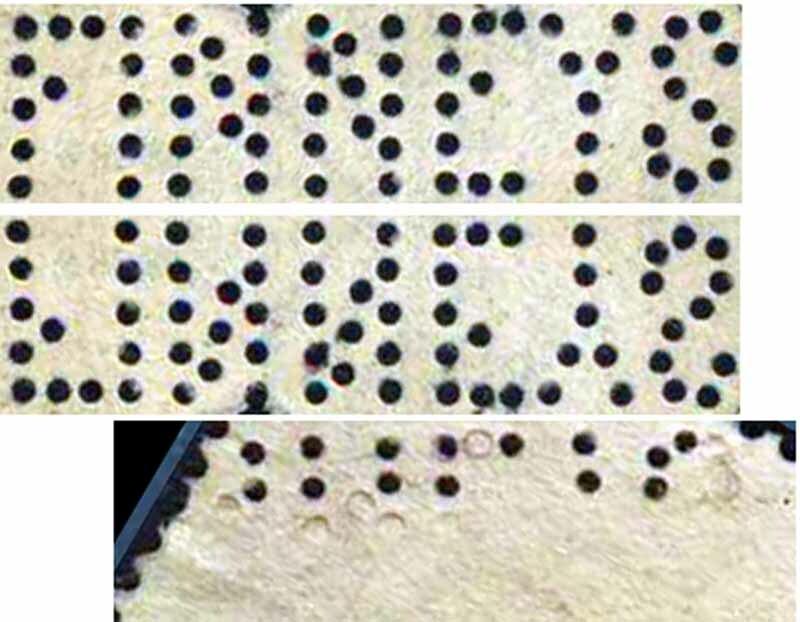 Late use of the device from about 1918 shows many missing pins, particularly across the top of the word Finney's, see postage stamp graphic below. 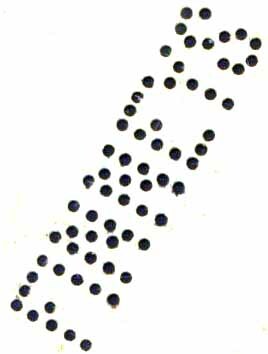 From c1918-1920 the pattern 'FINNEYS' was virtually halved by many broken & missing pins.